With winter closing in, Elly Cartwright dreams of escaping her inner-city existence for a more carefree life in the country. On a drizzly Monday morning, the view from her tram window is grim, and she isn’t looking forward to yet another mundane working week. But Elly’s week will be anything but mundane, with two people she’s closely associated with murdered in quick successions and two attempts on her life. Elly is just an everyday woman. Living with her adult daughter, working an average 9 – 5 job for an IT business and day dreaming about her fantasy, carefree life at Canton Creek. But one afternoon everything changes when her neighbour is mistakenly murdered on her footstep. With a strong character base, easy to visualise and eventful storyline, Jenny Spence presents a book that is full of twists and turns. I found it easy to follow all the characters as you travel with Elly and her work colleagues on an epic adventure through the heart of Melbourne and Sydney as they try to find a killer. With an exciting and gripping beginning, I did find that the book lagged towards the middle but quickly picked up within two or three chapters. I would definitely class this as an easy to read and absorb book, but that didn’t take away from the quality of the story line or characters and I still found myself connecting and getting attached to Elly and particular people around her. The book is a little high tech, with a lot of talk towards the end of the book about ‘triangulated’ signals and of coal mines and water resources. But all is explained in plain English for the layman (like me) to make sure you don’t miss any important information on your journey to figuring out the case. 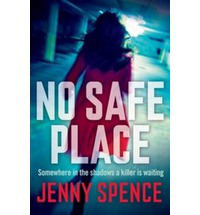 Jenny Spence has done a wonderful job at delivering an exciting, suspenseful and adventurous thriller that will leave you on the edge of your seat. I would highly recommend this book to anyone who is looking for a little bit of adventure and realism in their imagination, or just a fantastic read to pass the time.